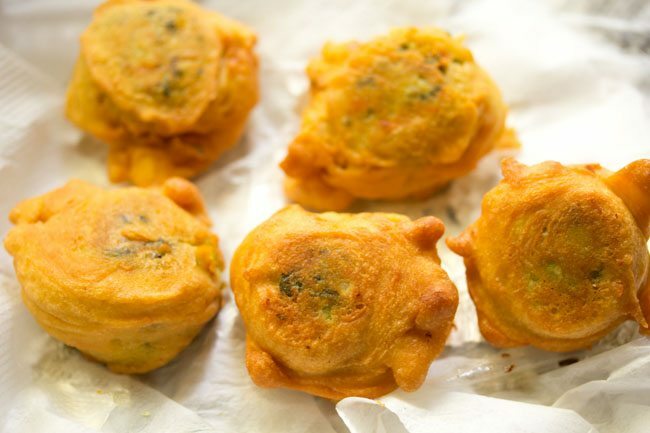 vegetable bonda recipe - deep fried snack of stuffed mix veggies coated with gram flour batter. 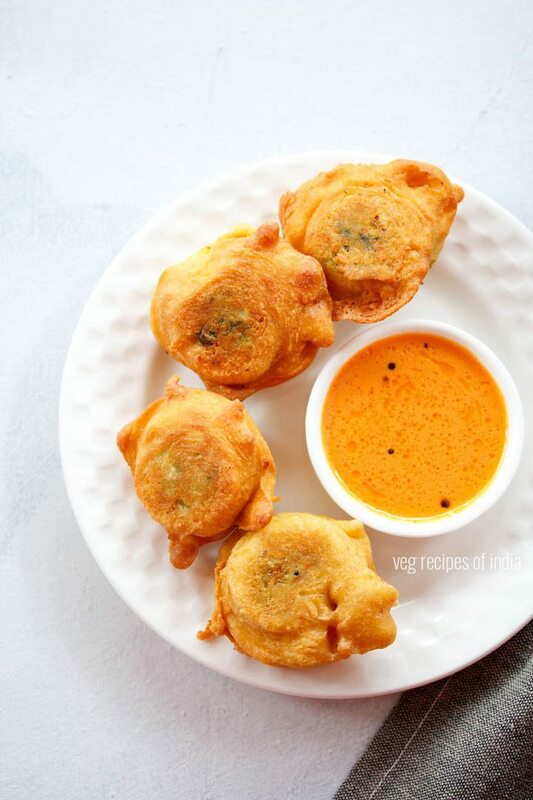 veg bonda recipe with step by step photos – deep fried snack of stuffed mix veggies coated with gram flour batter (besan). vegetable bonda is a variation to the popular potato bonda recipe. 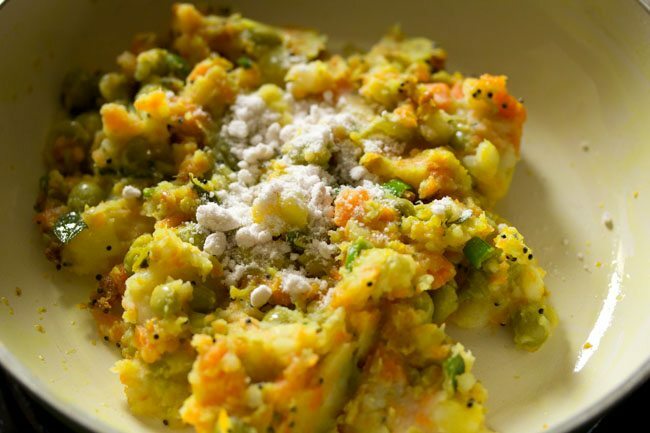 as the name suggests mix veggies are added. to make these addictive snack, you can add your choice of mix veggies. i added carrots, potatoes and peas. i always add these three veggies. i do not add french beans as we do not prefer french beans in a veg bonda. if there is cauliflower, then i add some of it too. you can also add capsicum and beetroots. this is also a no onion no garlic bonda recipe. if you want you can add onions or garlic. you can also check this mysore bonda recipe. i prepare these veg bonda the same way i make potato bonda. i had made veg bonda some days back when it was raining. so took pics too. 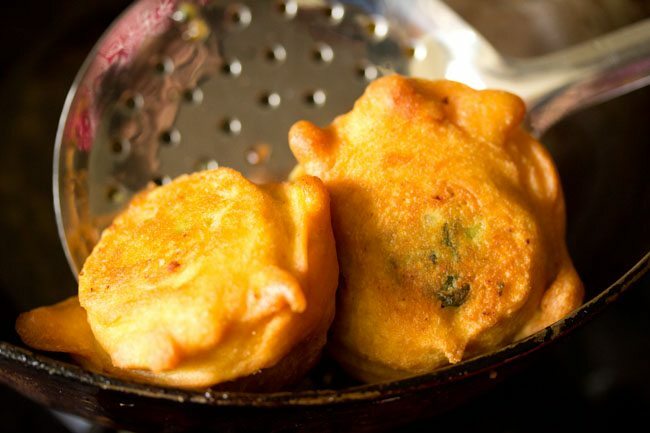 bonda is good evening snack one can enjoy during monsoons or in the winters. 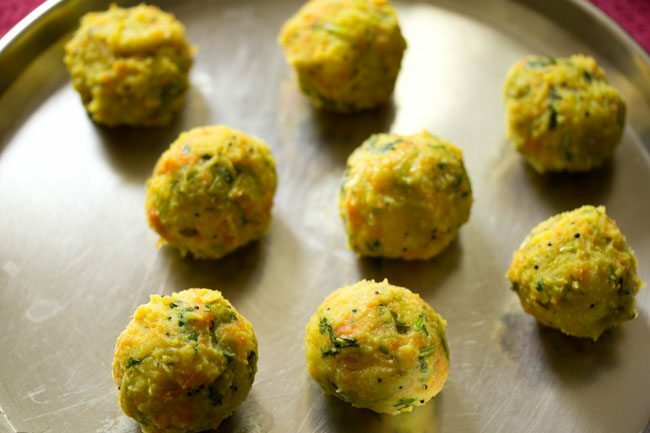 serve mix veg bonda with coconut chutney or coriander chutney or tomato ketchup. 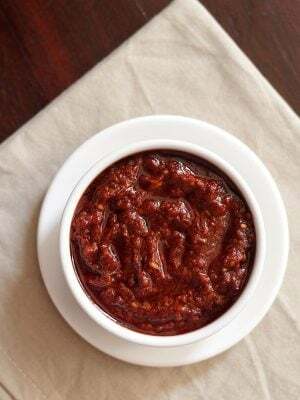 i served with red chilli coconut chutney. 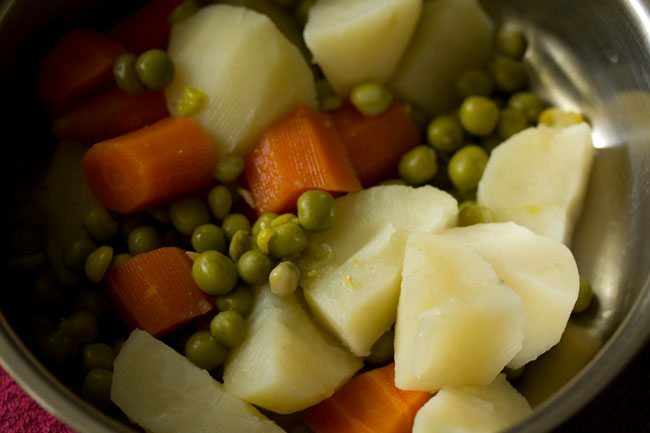 take 1/3 cup chopped carrots, 1 cup chopped potatoes and 1/3 cup green peas in a pressure cooker. also add 1.5 cups water. pressure cook the veggies for 3 to 4 whistles or for 9 to 10 minutes on medium flame. when the pressure settles down on its own, open the lid and check the veggies. you can also cook or steam the veggies in a steamer or in a pan. drain well and keep the veggies in a bowl. 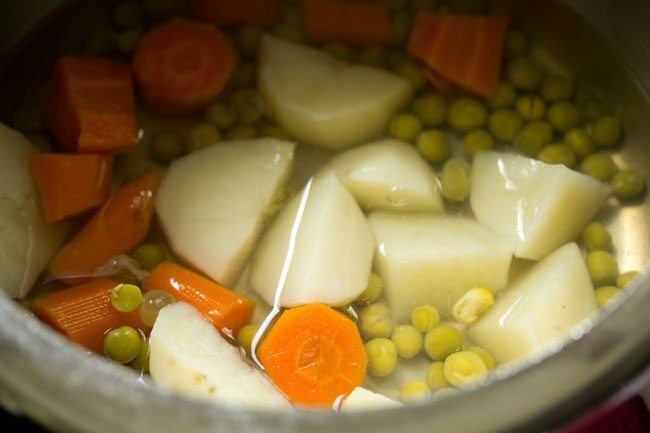 use the stock in which the veggies were cooked to be added to soups, dals, curries or for kneading parathas. this stock can be kept in a covered mug or a jar and refrigerated for a couple of days. 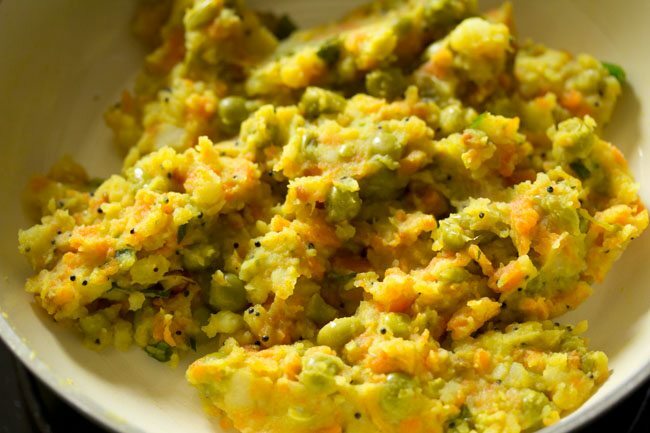 when the veggies are still hot or warm, mash them with a potato masher. heat 1/2 tablespoon oil in a frying pan. first add 1/4 teaspoon mustard seeds. 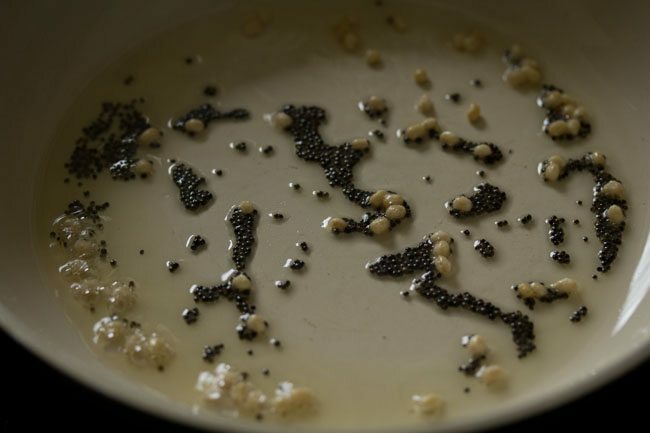 when the mustard seeds begin to crackle, then add 1/4 teaspoon urad dal. 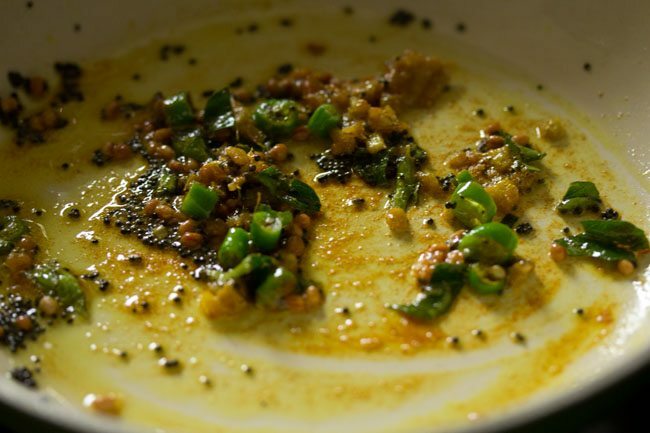 allow urad dal to get golden. 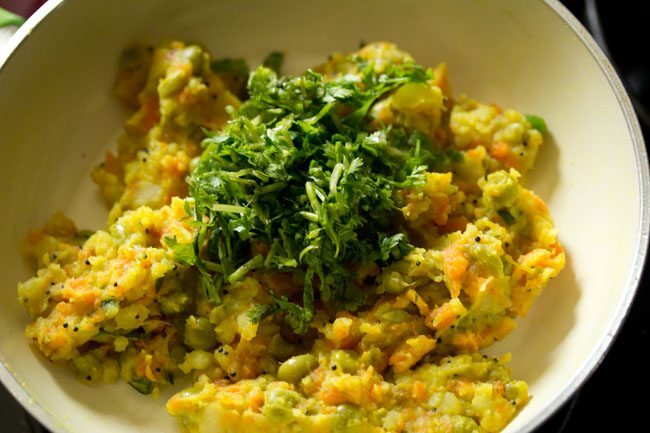 once the urad dal gets golden, add 1 teaspoon chopped ginger, a pinch of asafoetida/hing, 1 tsp chopped curry leaves and 1 green chili, chopped. next add 1/8 tsp turmeric powder. on a low flame stir and mix well. then add the mashed veggies. 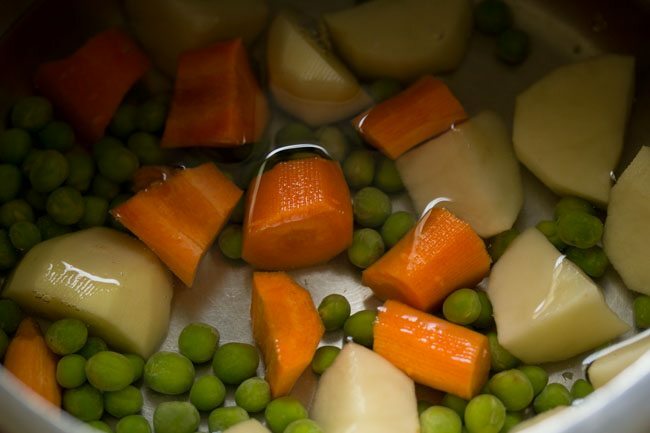 mix the veggies with the rest of the tempering ingredients very well. season with salt as required. mix again very well. saute the mashed veggies for 1 to 2 minute on a low flame. if there is too much moisture, then you can cook the veggie mixture for a few more minutes. switch off the flame. add 1/2 teaspoon lemon juice. mix well. check the taste and add more salt if required. now add 2 tablespoon chopped coriander leaves. mix well and keep aside. 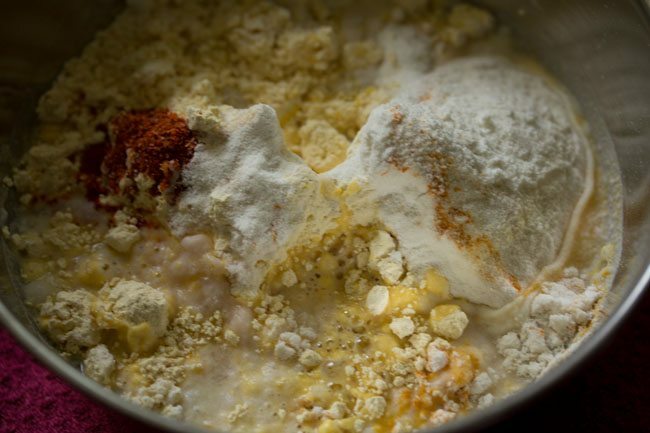 take this mixture in a separate plate and let it cool down at room temperature before you start making the bondas. in another bowl, take 3/4 cup besan, 3 tablespoons rice flour, a pinch of turmeric, a pinch of asafoetida/hing, 1/4 teaspoon red chilli powder and salt as required. add 1/3 cup water and make a thick flowing batter. 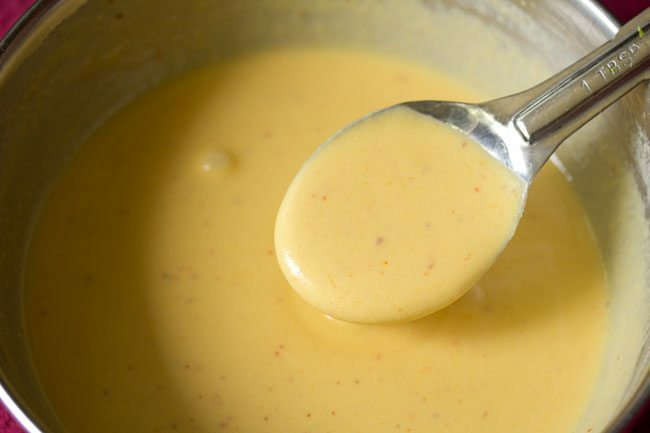 whisk to a smooth batter. break lumps if any with the wired whisk or spoon. check the taste and add more salt if required. now add a pinch of baking soda to the batter. you can skip adding baking soda if you want. mix very well and keep aside. make small to medium sized balls from the veggie stuffing. also heat a kadai or a pan with oil for deep frying. 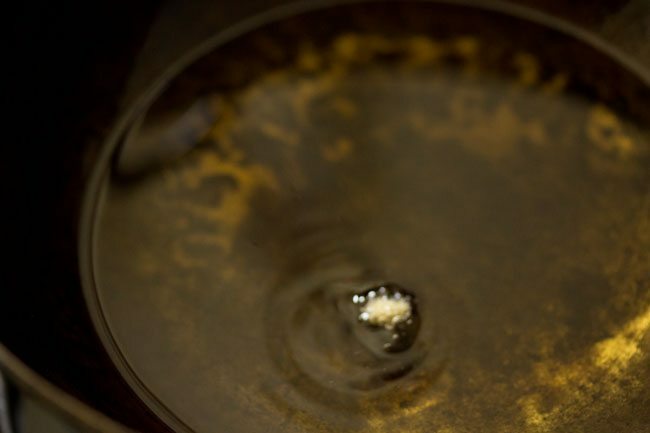 check a small drop of batter in the oil. if it comes up gradually but steadily, then the oil is ready for the bondas to be fried. now take the veggie ball and dip it in the batter. gently coat it with the batter. place it gently in the hot oil. 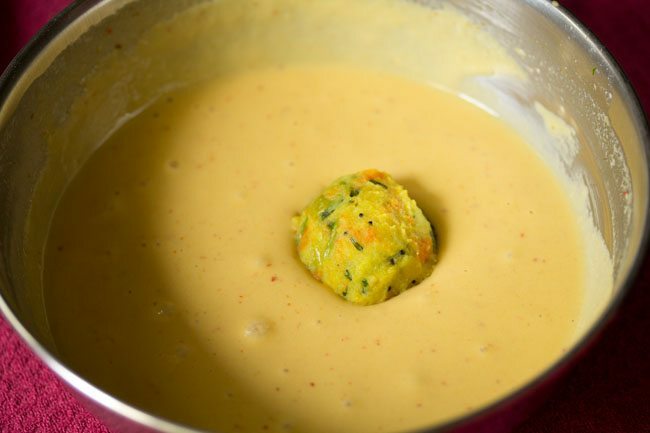 this way just before frying, dip each veggie ball in the batter and coat it well with the batter. do not over crowd the kadai. fry 2 to 4 bondas at a time. this will depend on the size of the kadai. 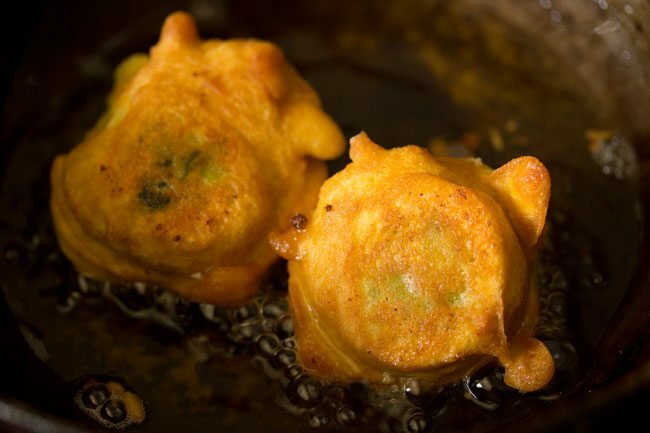 on a medium flame, fry the vegetable bonda. when one side has become golden, turn over and fry the other side. 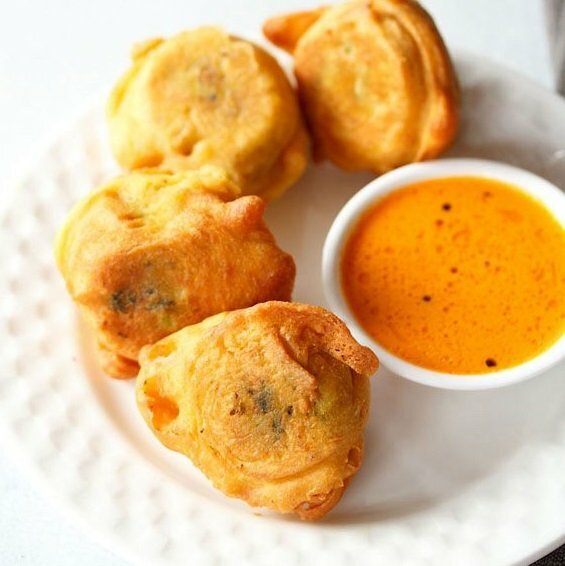 fry veg bonda till crisp and golden all over. drain veg bonda on kitchen paper towels to remove extra oil. 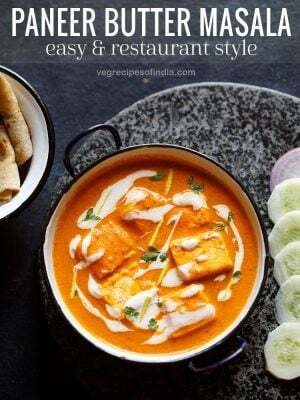 prepare all veg bondas this way. 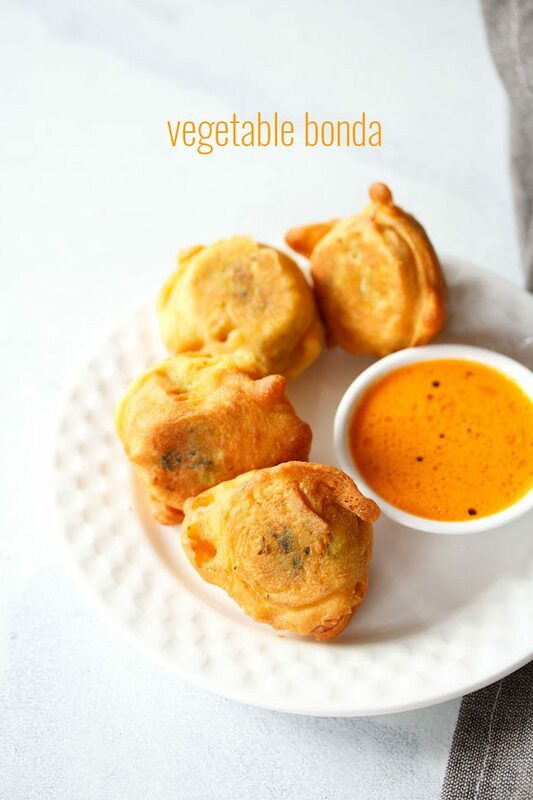 serve veg bonda hot with coconut chutney or tomato ketchup. 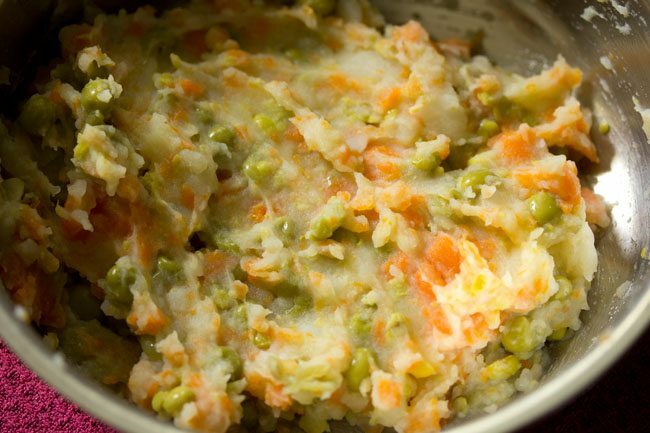 1. take ⅓ cup chopped carrots, 1 cup chopped potatoes and ⅓ cup green peas in a pressure cooker. also add 1.5 cups water. 2. pressure cook the veggies for 3 to 4 whistles or for 9 to 10 minutes on medium flame. when the pressure settles down on its own, open the lid and check the veggies. you can also cook or steam the veggies in a steamer or in a pan. 3. drain well and keep the veggies in a bowl. use the stock in which the veggies were cooked to be added to soups, dals, curries or for kneading parathas. this stock can be kept in a covered mug or a jar and refrigerated for a couple of days. 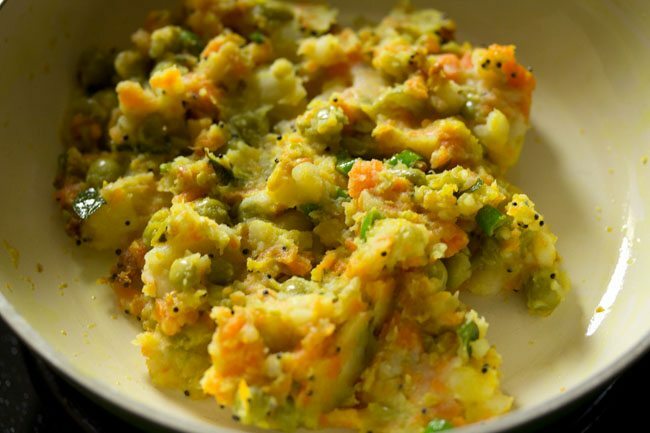 4. when the veggies are still hot or warm, mash them with a potato masher. do not make the mixture too pasty. some small chunks of carrots and peas are fine. 5. heat ½ tablespoon oil in a frying pan. 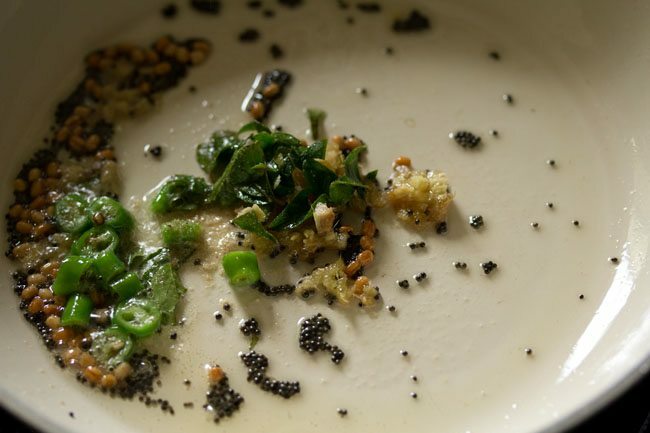 lower the flame and first add ¼ teaspoon mustard seeds. 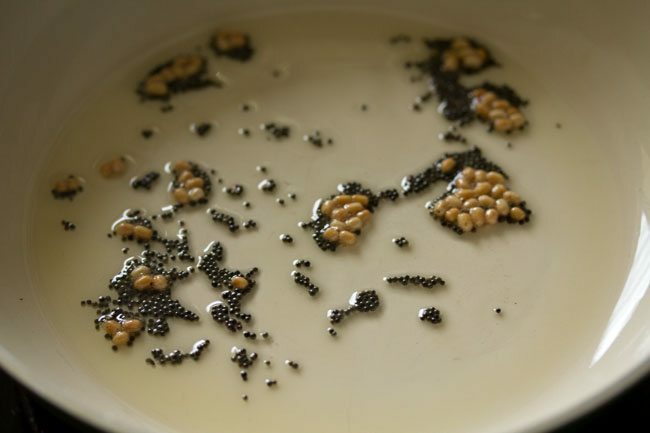 6. when the mustard seeds begin to crackle, then add ¼ teaspoon urad dal. 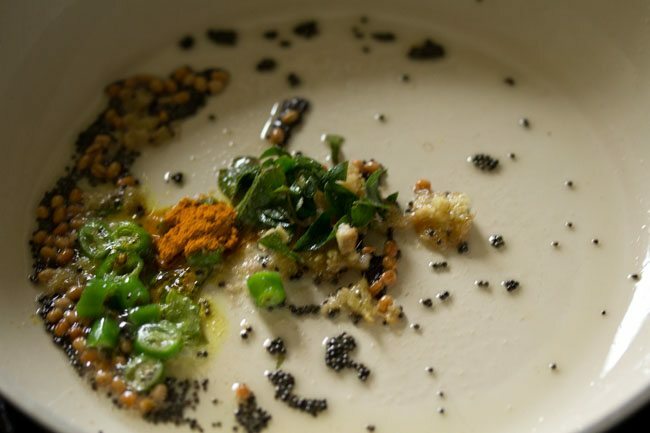 7. allow urad dal to get golden. 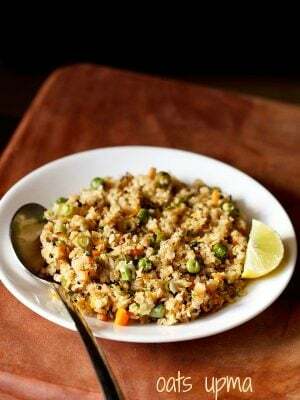 8. once the urad dal gets golden, add 1 teaspoon chopped ginger, a pinch of asafoetida/hing, 1 teaspoon chopped curry leaves and 1 green chili, chopped. 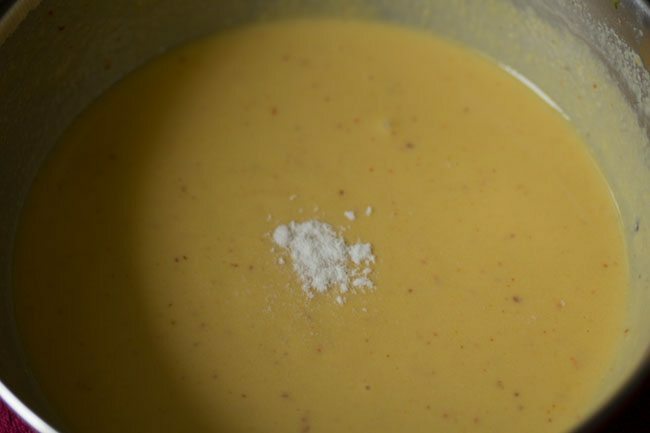 9. next add ⅛ teaspoon turmeric powder (about 2 to 3 pinches of turmeric powder). 10. on a low flame stir and mix well. 11. then add the mashed veggies. 12. mix the veggies with the rest of the tempering ingredients very well. 13. season with salt as required. mix again very well. 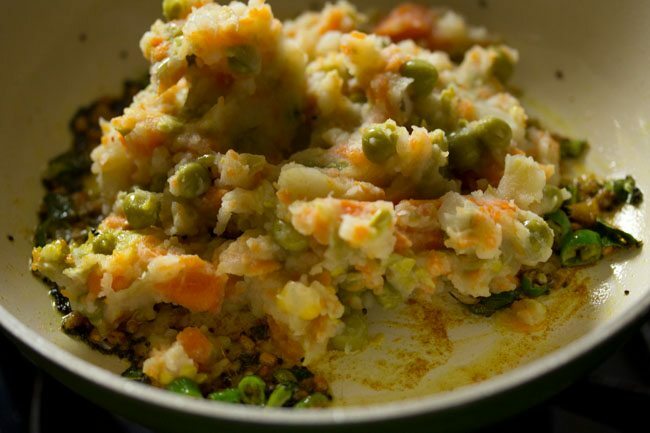 14. saute the mashed veggies for 1 to 2 minute on a low flame. if there is too much moisture, then you can cook the veggie mixture for a few more minutes. 15. switch off the flame. add ½ teaspoon lemon juice. mix well. check the taste and add more salt if required. 16. now add 2 tablespoon chopped coriander leaves. mix well and keep aside. take this mixture in a separate plate and let it cool down at room temperature before you start making the bondas. 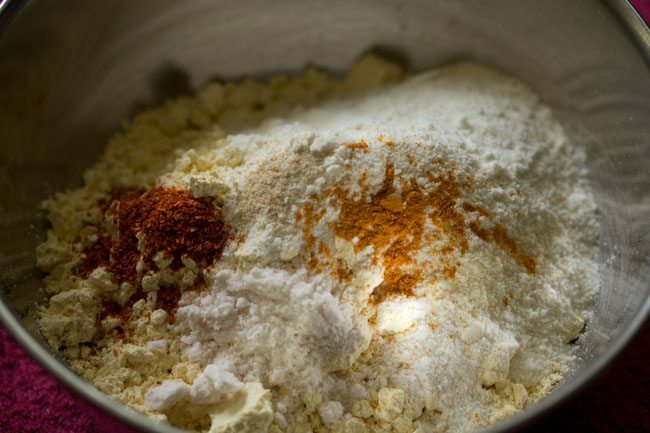 17. in another bowl, take ¾ cup besan, 3 tablespoons rice flour, a pinch of turmeric, a pinch of asafoetida/hing, ¼ teaspoon red chilli powder and salt as required. 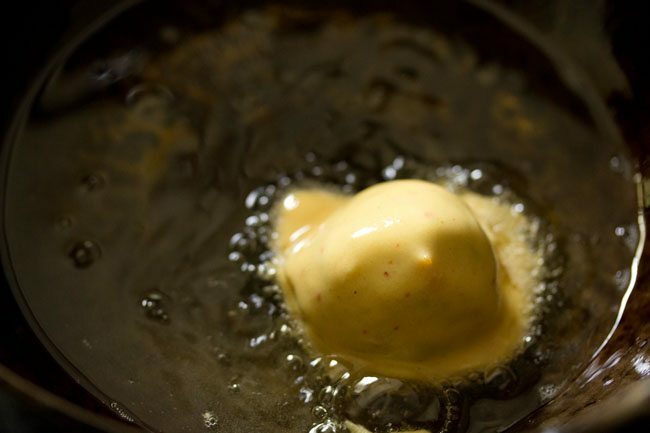 18. add ⅓ cup water and make a thick flowing batter. 19. whisk to a smooth batter. break lumps if any with the wired whisk or spoon. check the taste and add more salt if required. 20. here is a pic showing the consistency of the batter. depending on the quality of besan, you can add less ore more water. if the batter becomes too thick, then add some water. 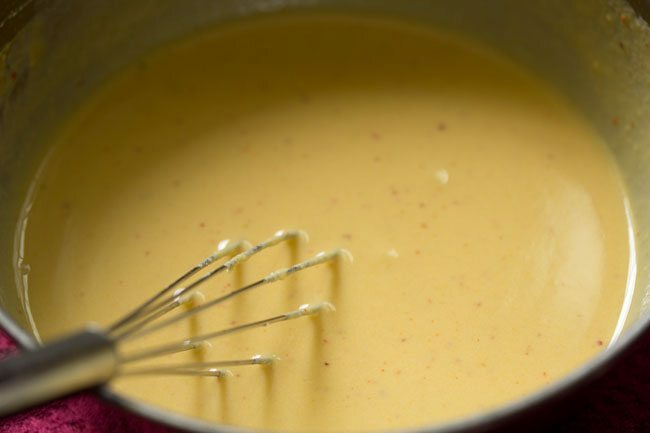 if the batter gets a medium consistency or becomes thin, then add some more besan. 21. now add a pinch of baking soda to the batter. you can skip adding baking soda if you want. mix very well and keep aside. 22. make small to medium sized balls from the veggie stuffing. 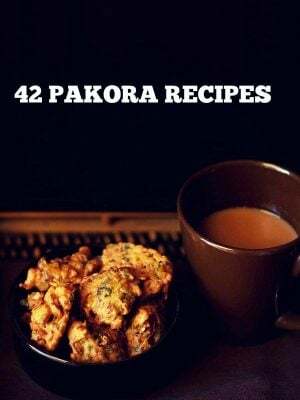 23. also heat a kadai or a pan with oil for deep frying. 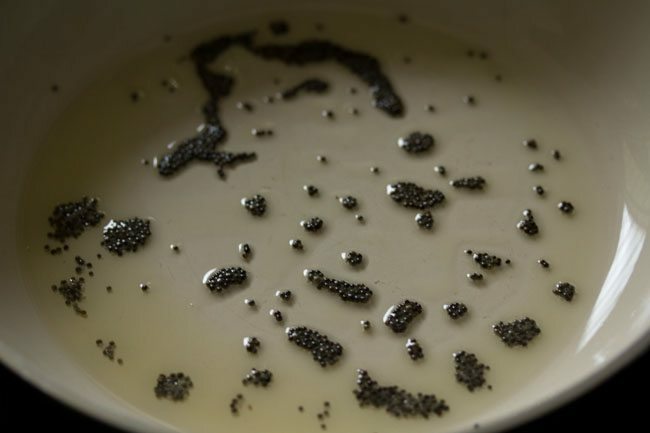 check a small drop of batter in the oil. if it comes up gradually but steadily, then the oil is ready for the bonda to be fried. 24. now take the veggie ball and dip it in the batter. gently coat it with the batter. 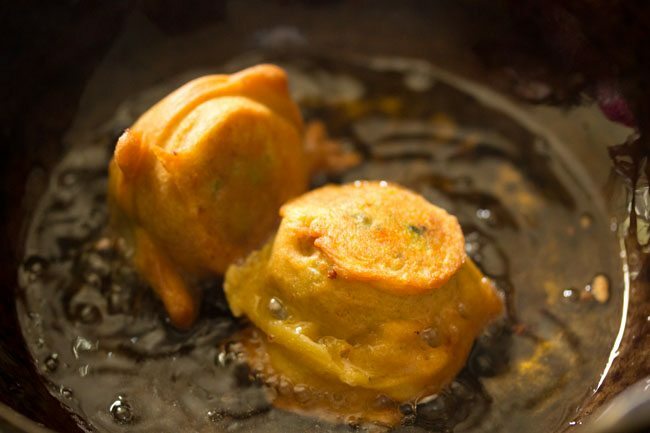 25. place the vegetable bonda gently in the hot oil. 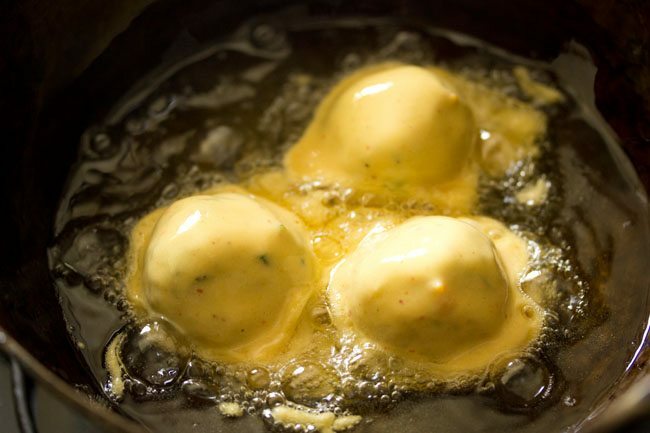 26. this way just before frying, dip each veggie ball in the batter and coat it well with the batter. do not over crowd the kadai. fry 2 to 4 bondas at a time. this will depend on the size of the kadai. 27. on a medium flame, fry the mix veg bonda. when one side has become golden, turn over and fry the other side. 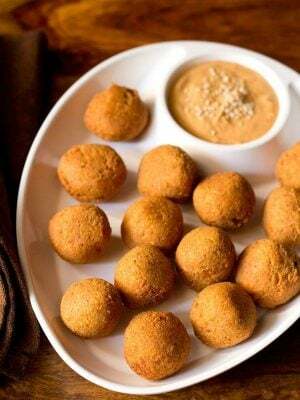 28. fry veg bonda till crisp and golden all over. 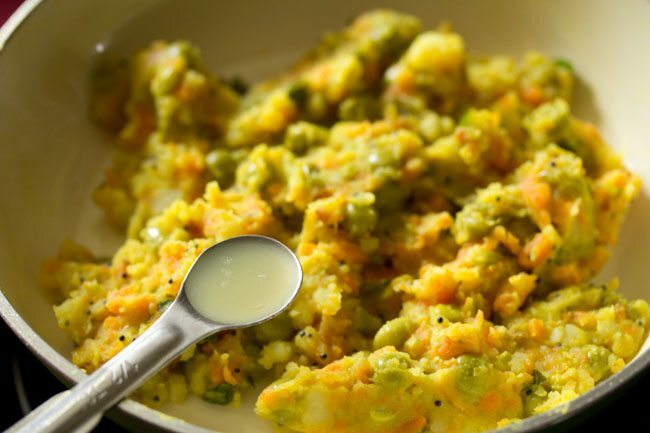 29. remove the fried veg bonda with a slotted spoon. 30. drain fried bonda on kitchen paper towels to remove extra oil. prepare all veg bonda this way. 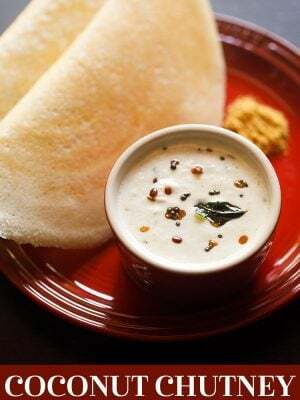 31. serve veg bonda hot with coconut chutney or pudina chutney or tomato sauce. pleased to know this priya, thanks for your kind words and good wishes. god bless you too.